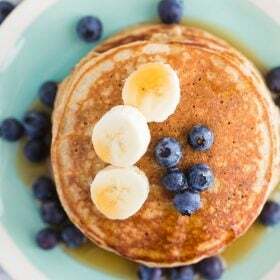 Make these easy protein pancakes THREE different ways! For all 3 of the pancakes: blend all of the ingredients together in a blender until smooth. The oatmeal pancakes take a bit longer so the oats can get fully blended. Heat a griddle to 300 degrees F and lightly grease with cooking spray. Pour 1/4 cup of the batter on the griddle and cook for 5 minutes on each side. The key with these pancakes is to cook them on a lower heat than traditional pancakes and for a longer period of time than traditional. If using a skillet, you want the heat on medium low. Top with your favorite pancake toppings and ENJOY!! The extra light recipe makes just 2 medium pancakes while the oatmeal recipes make 4 medium pancakes each.